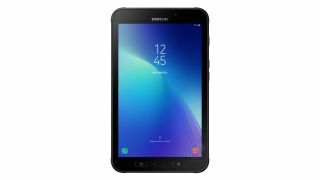 A host of new information has just been spilled online regarding the sequel to Samsung’s Galaxy Tab Active, with claims that the rugged tablet will run with a more powerful octa-core CPU, and will take further inspiration and features from the Note 8. Those features include the appearance of Bixby on the rugged slate, an S Pen stylus – which will slot into an integrated holder on the top of the bumper case – and a USB-C port will be incorporated, as well as a fingerprint reader. Note that the Bixby functionality will be limited to Bixby Home, not Bixby Voice, though. As Sam Mobile reports, the leak comes courtesy of Roland Quandt, and claims that the Galaxy Tab Active 2 will up the ante to a 1.6GHz Exynos 7870 octa-core processor (from a quad-core 1.2GHz CPU) backed up with 3GB of RAM. That’s double the memory of the original tablet, although the storage will remain the same at 16GB (sadly), and the screen will still be an 8-inch affair with a resolution of 1,280 x 800. Quandt does, however, note that the screen will be brighter at 480 nits (compared to the 400 nits of the original). The Galaxy Tab Active sequel will have twin cameras upped considerably in potency to 8MP and 5MP (from 3.1MP and 1.2MP), and a 4,450mAh removable battery, but the design will remain broadly the same. You can also expect an LTE variant of the slate for those who want to stay online while on the move. The tablet will run Android 7.1.1 and is expected to emerge before 2017 is out, although as ever, bear in mind that this is all just speculation at this point. Who knows, with the sequel imminent, you might be able to get a good deal on the original Galaxy Tab Active come Black Friday. In our review of the Galaxy Tab Active, we liked a fair bit about the tablet, and definitely the impressive battery life (which the sequel will seek to maintain, hopefully, given that it has the same size battery). The beefier hardware purported to be inside this new model should go a long way to making it more palatable on the performance front, too.